New York City is full of restaurants that specialize in one thing. 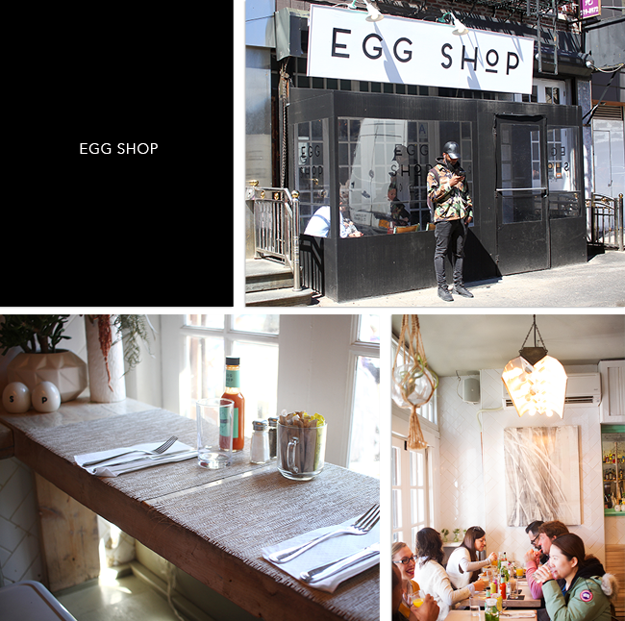 You can probably guess from the name Egg Shop, that their menu concept revolves around eggs. 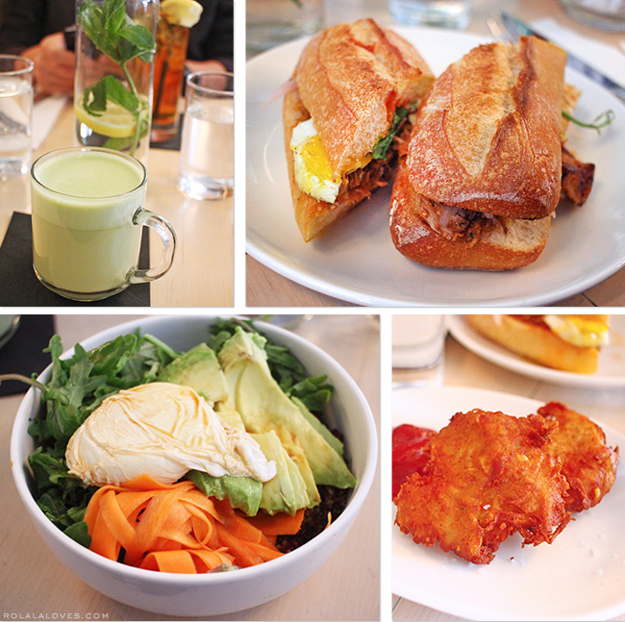 Egg Shop serves only organic and locally sourced eggs and this casual eatery is open for lunch and dinner as well as breakfast but whenever you go, prepare for a possible wait. For the record, we got there at noon on a Monday and were immediately seated. The space while bright, cute and airy, is not all that big. Blonde wood furniture with mint accents and chalkboards make up the decor and there is an open kitchen as well as seating at the bar/ counter. Their lunch menu consists of sandwiches, bowls called cruisers and a number of custom egg and cheese combinations. Hubster got a sandwich called The Beast which has pulled pork carnitas, a sunny side up egg, fresh cilantro, pickled onion, chipotle bourbon ketchup on french bread. I opted for the Spandex which consists of miso quinoa, farm greens, avocado, and pickled carrot, topped with a a poached egg. Yes it was healthy but it was also really tasty as was the sandwich which had a really nice mix of flavors. Of course the eggs were perfectly prepared in both. We also ordered a side of hashbrowns which were crispy and flavorful. And they make a nice matcha latte. Egg Shop gets a thumbs up for fresh and delicious food and our service was pretty good considering it was crazy busy there. I don't think it's a place that's worth waiting in line for and I probably wouldn't but it is worth a return visit. Are you a fan of eggs? What's your favorite way to have them? Mine is poached! Now, this sounds just like my kind of place - I love eggs in all their forms and I would definitely love to visit this place one day! Those sandwiches look so mouthwatering! 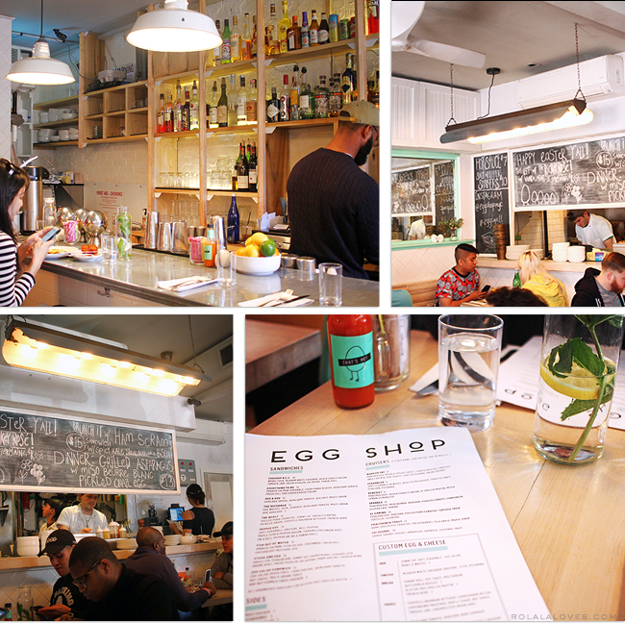 I love eggs and I would definitely check this place out when in NYC next. I would have Eggs Benedict if they serve them. This restaurant looks very lovely and I am a huge fan of eggs! Love eggs of all types! Like the name and the food looks so amazingly delicious. Yes to all things eggy! lol :-) My favorite is probably a veggie egg omelette. Or egg bread. not a fan of eggs, unless they are in cake, hehe. but everyone i know LOVES them. thanks for the review on the egg shop! I love eggs, omg yummy sandwiches! Thanks for sharing. The food looks mouthwatering delicious, Rowena. Cool places, would love to go there. Hahaha...Spandex! I love that name:D I really really love eggs, but alas, I had cholesterol problems before, so I have to watch how many I can eat. I just like to eat it very plain though...scrambled. I went to Egg Shop on one of the coldest days of winter & I think it was worth it. The El Camino cruiser was delicious! Maybe I'll give the side dishes a try if I go back next time. The hash browns you got look interesting. We eat A LOT of eggs! Haha! I love them either scrambled, omelette or just fried till the edge is a touch burnt and a light sprinkle of soy sauce on the top because that's how I had my eyes growing up. I have a friend who always has eggs for breakfast -- he would love this place. I do like a good egg whites plate on an English muffin, myself. For the past year, my favourite way to eat eggs has been Eggs Benedict. However, that might be just because it is something new to me. I may returned to my old favourite (soft boiled) soon:). Anyway, I love eating eggs and having them in a sandwich or a salad is always a great option! This place looks like a lovely place to eat. I always buy organic eggs (from friends that keep chickens for that purpuse). Fortunately, a lot of people do that here so organic eggs and cheese are easy to come by. I personaly adore goat cheese and I love to eat it in a salad that includes eggs:). I almost never buy eggs or cheese at a supermarket. My parents also buy organic! We can't really eat organic 100 percent all the time but it is good to do so when we can. Looking forward to your next eating post! always a good read. I'm impressed with my myself cause I've never been to NY but I already know about this shop! Definitely on my to-visit list! Such a nice concept specializing on eggs! I love eggs so this restaurant is right up my alley. Glad to hear that you had a good experience! Oh yes, poached all the way:) I especially love eggs for dinner breakfast-style:) Happy Thursday, darling. i'm not really an egg person, but i'd totally go there! it looks like a cute place! Mmm I love eggs and now I'm intrigued - quinoa miso? It sounds fab! I love a good egg! The name of this places is awesome! You are so right, NYC is full of restaurants which is why every time someone recommends one I always go and check it out at least once. I've never heard of the Egg Shop but when I get back to NYC I will definitely have to check it out. Thanks Rowena. I am a huge fan of eggs Rowena. I would love this place! So glad to hear everything was delicious. So good to know. Lovely place, the food looks great!